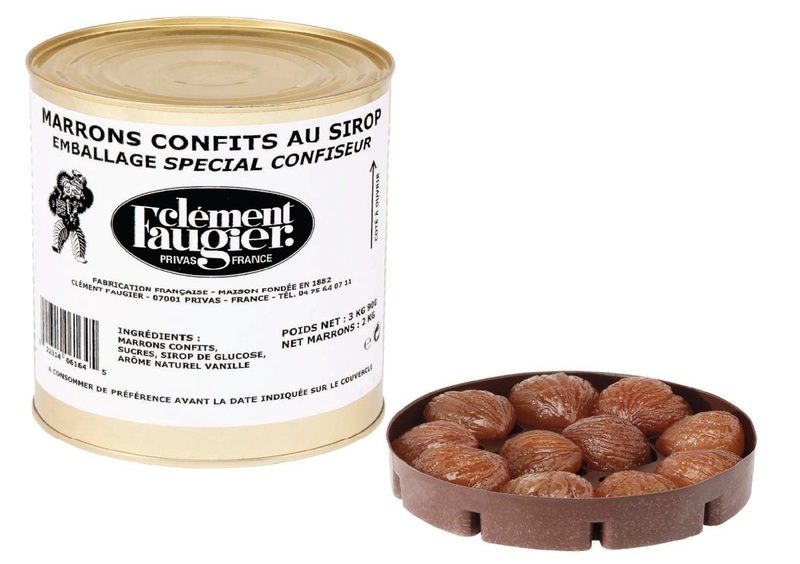 Whole candied chestnuts “Special confiseur” with syrup in tin 3/1. The candied chestnuts are arranged on 7 trays of 11 chestnuts (77 pcs/tin). Brown colored whole peeled chestnuts, candied in a pale yellow syrup with consistent texture. Whole chestnuts (54,6%), Sugar (39,5%), Glucose syrup (5,89%), Vanilla natural flavor (0,01%). These high quality candied chestnuts “Special Confectioner” can be consumed nature or as side for dessert or ice cream. You can also use them for glazing (preparation of marrons glacés). Size (in): L 12.6" x W 6.3" x H 7.5"